Winter has arrived in the UK. Temperatures are dropping, and with this the likelihood of snow and ice is increasing. Fleets of road gritters are out in force, treating our nation's roads to try and keep everything moving smoothly! While road grit (rock salt) doesn't go off, it is really important to keep it protected from the elements. Exposure to wet weather makes the grit much less effective, and the by-product of salt water run-off can be environmentally dangerous, to flora and fauna. Wet grit is also much more likely to stick to the gritting machines when it is being spread, meaning an inefficient, less thorough job and wasted resources. While some councils and local authorities may have the luxury of salt domes or permanent storage shelters for their grit stocks, other organisations and smaller outfits do not. In these instances, a heavyweight tarpaulin can be a real asset! Take the 270gsm Black/Silver range. These heavy duty PE tarps are available up to 12m x 15m, offering 180 square metres of coverage. 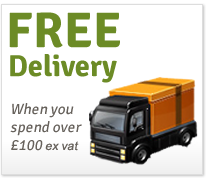 In the 250gsm Green/Brown range we can even supply a 22m x 25m sheet - this behemoth covers 550 square metres! All Tarpaflex tarpaulins have eyelets around the perimeter for securing in place, but you could also weigh the covers down with some filled sandbags. 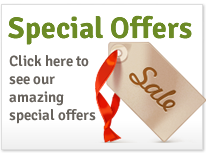 For a full list of all available sizes see our handy size guide, or call one of the Sales Team on 01409 221192. Why not save the De-Icer and use a dust sheet or tarpaulin to cover your vehicle windscreen overnight - our Mini Bolton Twill dust sheet is expecially useful due to its handy 3ft x 6ft size. Its also machine washable. 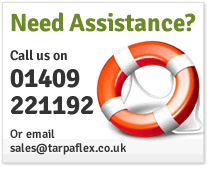 Tarpaflex Ltd is one of the UK's leading suppliers of tarpaulins and coverings. Delivering all over the United Kingdom and Europe, Tarpaflex has one of the most comprehensive ranges of tarpaulins available on the market. From flame retardant tarpaulins to dust sheets, camouflage tarpaulins to debris netting, whatever your tarpaulin need, Tarpaflex Ltd has it covered. Tarpaflex is a family run business, based in Devon with over twenty years experience within the business. Over the years they have become one of the most highly respected and established tarpaulin suppliers in both the UK and North America.